As per the customer's request, the front of the Hope Chest has a variety of domestic hardwoods with different thicknesses, adding a sense of depth to the front. 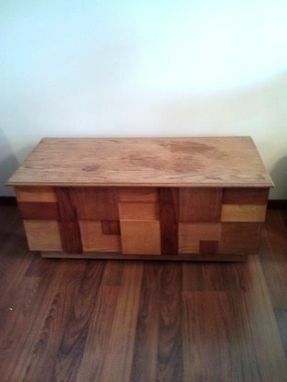 Hardwoods include: oak, cherry, maple, and walnut. 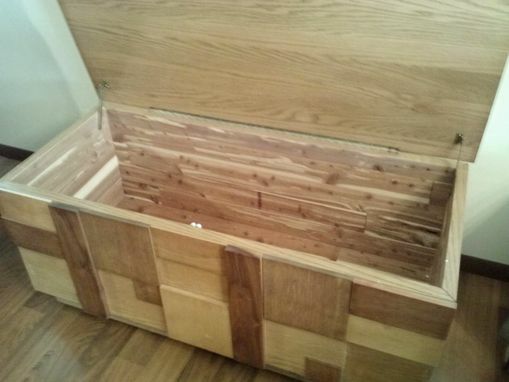 The inside of the Hope Chest is lined with cedar paneling. Also, the lid has a pair of lid supports that keep the lid from accidentally falling. The Hope Chest was given 2 coats of a satin polyurethane finish. Heavy duty casters allows the Hope Chest to easily be moved.